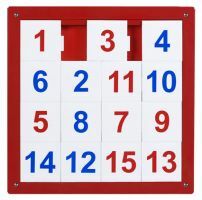 The Number Puzzle Panel offers a fun and unique mathematical experience that doubles as play and analytical skill development! With fifteen numbered tiles, kids are challenged to arrange the numbers in numerical order. So encourage your child to strengthen their logic and counting skills by participating in challenging play with the Number Puzzle Panel. Ages 7+.